A Successful Weight-Loss System Researched By Harvard University. 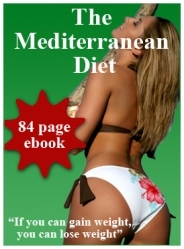 You may have heard of the 'Mediterranean Diet'. It is well known to be one of the healthiest eating regimes known to man as well as an effective and powerful deterrent against heart disease, cancer and other life-threatening illnesses. What you might not know is that if applied in the correct way this type of diet can also be used as an extremely effective means of losing weight - and a lot of it!! Losing weight AND improving your health at the same time? Unheard of - until now! Unlike 'fad' diets which are primarily designed for extreme weight-loss, the Mediterranean Diet actually works WITH your metabolism to achieve long-term and permanent results. The speed that you lose weight could be slightly slower but the end result is MUCH better. Diets such as the 'Atkins' or the 'Cabbage Soup', apart from being dangerously unhealthy, have been shown to make the dieter lose water rather than actual fat - this can be extremely counter-productive. If weight is lost too quickly there can be up to a 6% loss of muscle tissue as well as any fat or water lost. As a result, when the weight eventually returns - and it always does - more fat actually replaces the lost muscle which means the dieter will end up being fatter than he was before!! To lose weight effectively, the method has to be realistic and according to research carried out by Harvard University, the Mediterranean Diet is the solution. ‘The Mediterranean diet’ is probably the most realistic and safest way not only to lose weight, but to also help prevent serious diseases such as cancer and heart disease. There have been countless studies on this type of diet by scientists keen to discover why heart problems and obesity are so low in the countries that border the Mediterranean Sea. This nutritional concept includes a high consumption of fruit, vegetables and grains, a medium consumption of olive oil, fish and white meat and a low consumption of red meat, dairy products and saturated fats. Red wine also plays a part in some versions of this diet as it contains powerful anti-oxidants called ‘polyphenols’ which offer protection against cardiovascular diseases. In fact the ‘American Heart Association’ refers to the ‘Mediterranean Diet’ as the ‘gold standard’ in heart disease prevention. The most important element in this diet is ‘olive oil’ which acts as a healthy substitute for commonly used saturated fats such as butter and margarine. Studies by various institutions including ‘The Harvard School of Public Health’ have discovered that olive oil contains extremely beneficial properties which can lower the risk of coronary heart disease by reducing blood cholesterol levels. This research also found that patients with ‘hypertension’ who purposely switched to a diet with a high olive oil consumption were able to reduce their ‘anti-hypertensive’ drug dose by up to 50%!! Olive oil is also thought to lead to a reduced risk of some cancers and even diabetes. One of the other key aspects of the ‘http://www.safe-and-easy-weightloss.com/Mediterranean Diet’ is the low consumption of dairy products such as cheese, cream and milk. The belief for instance that cows’ milk is beneficial as it contains calcium is far from the truth. Research has shown that as the calcium in cows’ milk is pasteurized, it is therefore inorganic meaning it becomes largely unusable in the human body. Did you also realize that full fat milk is mainly made up of puss cells? Vegetables, especially root vegetables are much better sources of calcium. A diet low in dairy products will not only make you feel less lethargic, it will boost your energy and improve the condition of your skin. This will obviously be beneficial to those who suffer from skin problems such as psoriasis and eczema. The ‘Mediterranean Diet’ is without doubt the only option you should consider in any effort to lose weight. Many popular diets like those of the ‘high-protein’ variety are extremely harmful and although they sometimes succeed in delivering their promises of ‘shedding weight’, the chances of keeping this weight off are very unlikely. Extreme dietary modifications are impractical - if not impossible - for most people to maintain on a long-term basis. Due to the fact the majority of these diets do not even incorporate a consistent or stable eating program, the noticeable reduction in weight is actually the body’s loss of water rather than actual fat. If weight is lost too quickly there can also be up to a 6% loss of muscle tissue along with any fat lost. If the weight is then re-gained, MORE fat replaces the lost muscle. This usually means you will eventually become FATTER after finishing the diet! The simple fact is, if you want to successfully lose weight for the long-term and protect yourself from illness, the ‘Mediterranean Diet’ is the diet for you!